IT’S NOT every day that one’s artwork is put on display at the New York State Museum. For Janet Matthews it’s the third time running. The Narre Warren North artist’s latest drawing recently won the Focus on Nature Jury Award in April run by the museum, an honour reserved for the 14 best artworks out of the 80 to 90 on display at the exhibition from artists throughout the world. “I still can’t believe it. This year I’m the only Australian that got an award, wow, it still makes me really smile,” Janet said. Janet said it was the third time she had been contacted to take part in the museum’s Focus on Nature exhibition but the first time she had won the Jury Award. “It’s wildlife or science based nature stuff, and I do drawings of wildlife, birds and animals,” Janet said explaining the exhibition. “I draw mostly Australian animals using colour pencils and graphite. Janet said she always starts a drawing with story to tell, a context for the animal that she later creates on the canvas. The official title for her winning echidna artwork was Look I Can Swim! “My main focus for each work is usually a story, a personal interaction, a family situation, a story that I tell through the animal or bird,” she said. 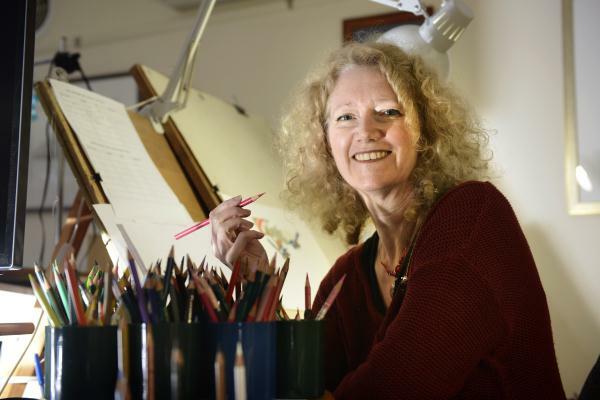 Having carved out a career for herself soon after leaving university, Janet has honed the craft which sees her spend more than 10 hours a day with a pencil in hand at her home studio. “I decided to be an art teacher, because that’s the only option at high school that was available to me. I didn’t want be secretary or a nurse. “I did my first year of university and with connections through other art teachers I discovered that they didn’t have time to do their own artwork. With her artwork on proud display in New York, Janet’s decision to change her career trajectory certainly appears a wise one – even if she hasn’t been able to fly over to see her work yet. But with her back recovering well from a significant injury she believes it will only be a matter of time before she goes over to the Big Apple to see her echidna swimming in the water.